A pregnant police officer investigates crime in Minnesota. 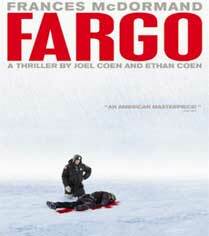 Director Joel Coen delivers a quirky, offbeat, true-life Minnesota comedic crime drama. Coen received a nomination for best directing. The cast includes: Frances McDormand, William H. Macy, Steve Buscemi, Harve Presnell, Peter Stormare, Kirstin Rudrud, John Carroll Lynch, Larry Brandenburg, Steven Reevis, and Jose Feliciano. #84 on the AFI Top 100.